Some numbers Cummins revealed in its earnings report could determine where its shares are headed. Cummins (NYSE:CMI) is on a roll. Just when the stock appeared to be losing steam after a blockbuster 2013, the engine maker delivered a solid set of numbers for its fourth quarter earlier this month, trampling Street estimates by a gaping margin. Investors couldn't have asked for more -- the stock has climbed 11% in less than two weeks time, as of this writing. But while the market focused on Cummins' robust growth on both the top and bottom lines, several key metrics, which say a good deal about the company's financial position and current standing in the industry, went unnoticed. But they can't be ignored, given that each of those factors could play a role in determining the future direction of the company and its share price. So here are three key numbers that every Cummins investor should know about. Cummins' revenue for the financial year 2013 was relatively flat at about $17 billion, but its operating margin dropped a percentage point to 12.5% as demand from both the heavy-duty truck and power generation markets weakened during the back half of the year. The company fell short on its own expectations of generating margins between 13% and 14% for the year. But investors shouldn't read much into that drop; not because it was a small one, but because it was largely the result of external factors that were beyond the company's control. 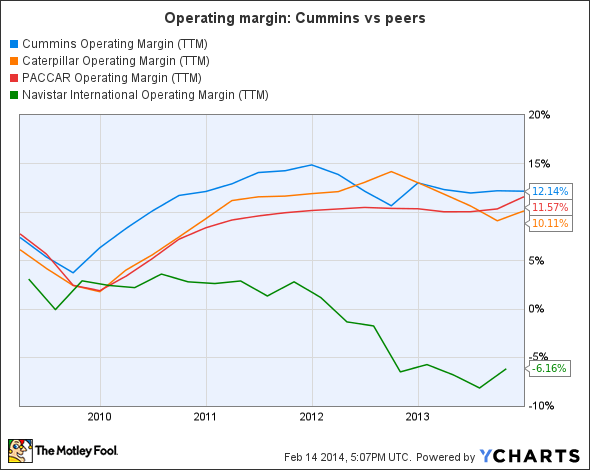 More notably, Cummins still boasts the best operating margin in the industry, as evidenced by the chart below. While truck maker PACCAR (NASDAQ:PCAR) is catching up, thanks to healthy demand for its trucks in the U.S. and Europe, Navistar International (NYSE:NAV) lost billions of dollars after its engine technology failed to clear the U.S. Environmental Protection Agency's emission standards in 2012. Caterpillar (NYSE:CAT) could have delivered better margins had it not been for its sluggish mining equipment division. Otherwise, Caterpillar's power systems division, which sells engines, emerged as the largest and most profitable business last year. Cummins sounds cautious for the rest of the year, projecting its operating margin to end between 12.7% and 13.25% for 2014. While that's uninspiring, Cummins is aggressively reducing costs and realigning operations, especially for slower businesses like power generation. Coupled with an improving truck market, that could help the company's margins trend even higher this year. Cummins is the leading engine seller in North America, and is going all out to maintain its leadership position. It gained an incredible 10 percentage points in the North American medium-duty truck market in 2013, ending the year with a solid 63% share. Better yet, Cummins expects to hit 70% share by the end of this year. While nearly every major truck maker has put its weight behind Cummins' engines, Navistar joined the league last year when it adopted Cummins' ISB 6.7-liter engines for its trucks in a bid to salvage some of its lost reputation and win customers back. That should continue to boost Cummins' engine sales this year. Cummins engines also dominate the North American heavy-duty truck market, but it isn't seeing the kind of growth there as in the medium-duty segment. The company expects to end 2014 with flat market share of about 39%. Competition in the market is heating up, and Cummins mentioned PACCAR's own 13-liter MX engine to be a strong competing product. With PACCAR expecting sales of the 13-liter engine to grow further this year, Cummins may have to work a bit harder to remain at the forefront. And that's one area investors need to keep an eye, because heavy-duty trucks currently contribute more than a quarter to Cummins' total revenue. Last year's results offer yet more proof of Cummins' solid financial standing. The engine maker generated record operating cash flow worth $2.1 billion in 2013, or free cash flow worth $1.3 billion for the trailing 12 months. That's a good 87% of its net income for the period. More importantly, Cummins increased its dividend by 25% in 2013 while repurchasing shares worth $381 million through the year. In other words, as Cummins rakes in more cash, shareholders can expect greater rewards. Investors will be happy to know that the company expects to generate at least as much in operating cash flow this year as 2013, and plans to commit half of if to its shareholders. So if improving end markets help Cummins generate greater revenue and profits this year, investors can most certainly hope to receive fatter dividend checks. For an investor, the decision to invest in a company is based on a lot more than just its top-line growth. Cummins continues to maintain healthy margins and generate greater cash flows even in challenging times. While the company's lack of growth in the heavy-duty truck market could be a concern, its rapid rise in the medium-duty segment is commendable. And there's nothing better than when the company wants to share its success with its shareholders. In fact, Cummins' growth story doesn't end here -- it has some clear plans in place for 2014. I'll cover them in an upcoming post, so stay tuned.